The final Hammer Christopher Lee Dracula, though not quite their last film to feature the Count, nor Lee’s final portrayal of the character [that would be in the 1976 French comedy Dracula And Son], The Satanic Rites Of Dracula is a film I hadn’t seen for at least 15 years, due to it being hard to obtain in a decent print on DVD. The copy I bought the other day was a Spanish disc, supposedly the best of the releases in terms of quality, and watching it convinced me that the version I’d had on video recorded off ITV had been missing several minutes of footage, though I couldn’t pinpoint what exactly. Its reputation is possibly even poorer than Dracula A.D. 1972, though I think it’s a considerably better film. At the very least, it does more with the idea of Dracula in the present day, even if he’s in the film even less, and it certainly doesn’t suffer from a shortage of ideas, from government conspiracy to devil worship to a reclusive Howard Hughes-inspired character to Dracula as a Bond-like villain out to conquer the world – even if some of them are borrowed and they don’t all hang together very well. 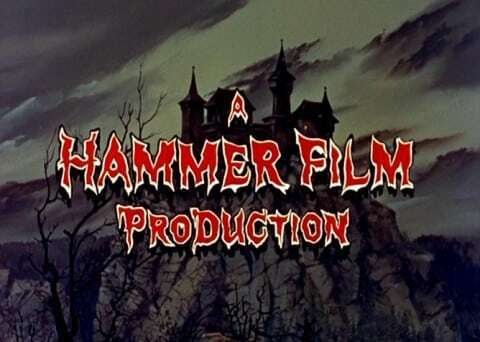 At times it feels more like an extended episode of The Avengers than a Hammer Dracula film, with only a few of the traditional-type scenes you would expect, though some of those are rather good. It was Jimmy Sangster who initially wrote a treatment for this film, and he maintained some continuity with the previous episode, though some, but not all, of these references were lost when Don Houghton wrote the actual screenplay. The initial title was Dracula is Dead… and Well and Living in London, referencing a musical called Jacques Brel is Alive and Well and Living in Paris, but Lee publicly complained about it and eventually got his way. Stephanie Beacham was intended to reprise her role as Jessica Van Helsing but was unavailable, though Michael Coles did return. 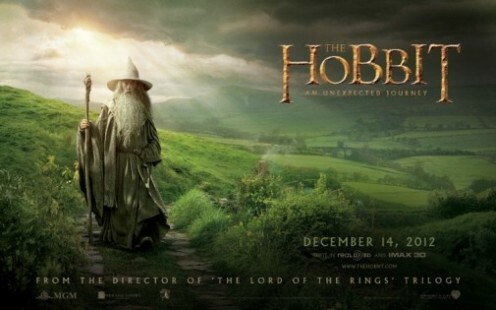 The film was shot at Elstree and nearly Buckettsland Lane, plus London’s South Kensington and Notting Hill. 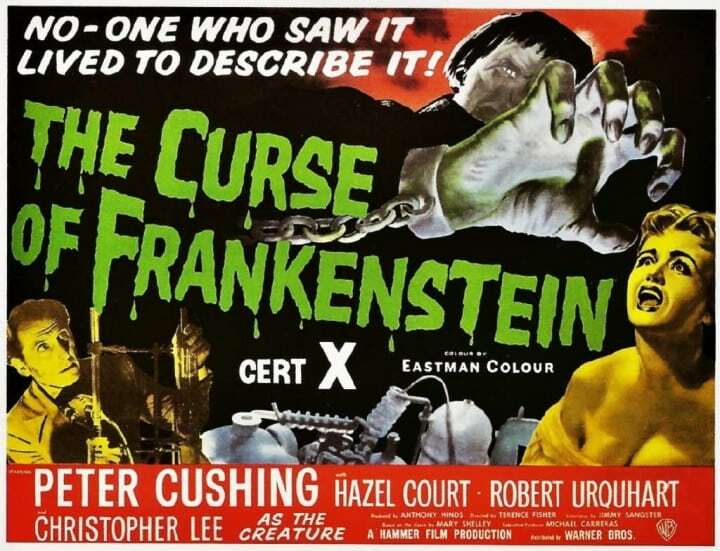 The BBFC ordered the shortening of the opening sacrifice sequence, two stakings and an electrocution, though the required cuts to a shooting were never made. 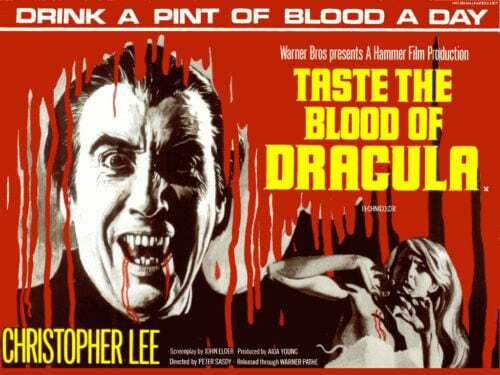 It actually came out first in West Germany in November 1973, the UK release not happening till January the next year, when the double bill with Blacula did mediocre business. Warners declined to release it in the US, where it sat on a shelf for four years until small independent company Dynamite put it out, missing four minutes of dialogue, as Count Dracula And His Vampire Bride. One second of a gory naked breast [something the BBFC believed incited rapists] was removed from the UK video. 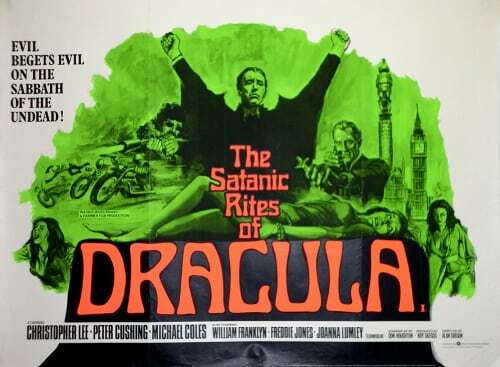 Because the nature of its distribution, The Satanic Rites Of Dracula got lots of public domain home releases of dubious quality and legality, while it’s never even had a DVD release in the UK. Rumours are that Warners have bought back all the rights so a decent release is hopefully forthcoming. Shots of London landmarks with the shadow of Dracula play under the credits, then it’s straight into some action as a bound and beaten man throttles his guard, escapes, and just about lives to tell of what he’s seen to his boss Torrence, albeit much of it as played by a tape recorder. This means that we see the satanic ceremony in short bits and pieces rather than as one whole scene which could have worked better. Chin Yang the leader of the cult slits a cockerel over a naked woman who writhes sexually as the blood drips on her and attendees undergo a perverse baptism. She’s then stabbed, but then, for no other reason except that is must be down to black magic, comes back to life. Because the minister who heads their department is one of the people involved, the Secret Service have to proceed carefully, though this aspect of the story isn’t developed as much as it could have been. Inspector Murray is called in, and he encountered odd happenings in the last film so he’s obviously not very surprised at what’s going on here. For the first time since Dracula we don’t get a resurrection scene, but Dracula soon shows up to bite Torrence’s kidnapped secretary, preceeded by a shutter banging, a lamp swinging and fog seeping under a door in the film’s most atmospheric moment. But then Van Helsing gets a good introduction too, appearing in profile smoking, reminding those in the know that Peter Cushing had this habit for most of his life. Scenes of exposition alternate with some chasing and shooting where our good guys encounter the cult’s Afghan-wearing motorcyclist henchmen [can’t be inspired by Orphee this, can it? ]- and a few vampire moments. 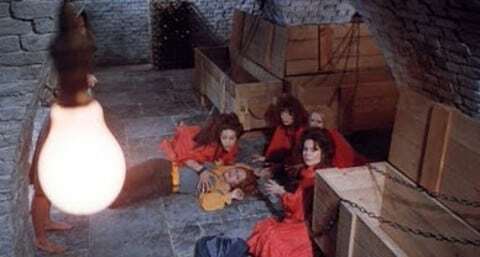 A cellar in the big house inhabited by red robed, chained, female vampires provides a few thrills, though it’s funny how they seem to lash out at Jessica for ages from all directions and for quite a while without seeming to do any actual damage to her at all. After his first appearance, Dracula doesn’t then appear, aside from a brief short of him carrying a victim, until the last 20 minutes, where he’s revealed as a shady property speculator called D. D. Denham who doesn’t like to show his face. Having the Count be like this is a nice, slightly subversive, idea, though it would have worked better if Denham had been spoken of much earlier, and why on earth doesn’t Van Helsing recognise him? Mind you, I also can’t figure out why he tries to shoot him with a silver bullet when in the previous film he said they were unreliable. Adding to the many things that harm vampires [it really is getting hard for the poor things] is – the hawthorn tree. So when Dracula chases Van Helsing at the end, he clumsily wanders straight into a thorny bush as if he’s virtually blind, though Lee’s acting here seems very realistic, as well it might be – Lee really did have to tear himself free and some of the blood you see is real. And Dracula does appear to have a bit of a death wish in this movie anyway. It’s eventually revealed that he wants to let loose an advanced version of the bubonic plague on the planet, something that would destroy humanity but which would also leave him with no victims, though Van Helsing thinks that the immortal, lonely Dracula may be getting tired of it all. If only Lee had been given the opportunity to show some of this. The stuff is made by a friend of Van Helsing’s called Dr. Julian Keeley, played by Freddie Jones at his craziest, the actor sure livening up the longest of the film’s dialogue scenes. There are some rather stupid moments, like when Van Helsing, somebody who’s surely wanted dead by the villains, is shot at nearly point blank range and the bullet just grazes one side of his forehead. Just a bit of re-writing could have fixed this before shooting began, but evidently nobody cared. Some of the climax is terribly rushed and confused, especially when the nature and amount of the bacteria is concerned, while certain elements throughout, like the nature of Chin Yang, could have done with elaboration. The one biting scene isn’t shown in detail, but there’s a fair bit of violence throughout with three stakings [though only one explicit], some gory shootings [though it’s hilarious when one shot person literally leaps over the bonnet of his car before falling down dead], and even an electrocution. 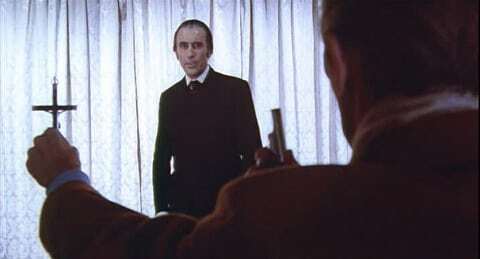 Director Alan Gibson shows that bit, as he does several others, in slow motion, and oddly employs a fish eye lens in a couple of other moments, like when Van Helsing is visiting Keeley’s house. He never seems to have a strong enough handle on the material, and certainly has little sense of the Gothic, though then again they weren’t really going for that style in this one anyway. For some reason Lee plays Dracula with a middling Transylvanian accent when he’d never attempted such a thing before. It gives a slight stiffness to his performance though he’s still as awe-inspiring as ever. Cushing looks even frailer than before, but still gives it his all. Joanna Lumley is Jessica here though she seems ill-at ease. John Cacacas composed the score, which maintains the up to date style of Michael Vicker’s work for Dracula A.D. 1972 but is a more diverse work, some times reminiscent of Lalo Schifrin in its action cues. The main theme is extremely catchy while Cacavas is still able to provide some moody moments here and there, especially an extremely eerie, swirling soundscape for some of the vampire scenes. The Satanic Rites Of Dracula never binds its disparate elements into a unified whole and doesn’t do enough with some of its ideas, while some may say that for much of its length it’s not really much of a horror film at all. But it deserves some praise for its audacity, and is certainly rarely dull.